The Designing for the Ageing Brain symposium held in collaboration with Centre for Person Centred Research (CPRC) and Lab4Living was an exciting initiative that brought together both international and local experts to share their work and discuss the challenges and opportunities for developing design-led solutions to promote well-being for people living with dementia and other ageing-related neurological conditions. Through a series of expert talks and workshops, the symposium explored how good design can be implemented in hospital environments, healthcare services and community-focused interventions to help those living with cognitive impairment to experience better well-being. Along with the DHW Lab and CPCR the key note speakers at the symposium were Dr Claire Craig and Prof Paul Chamberlain from Lab4Living, Sheffield Hallam University. This was a great opportunity to learn about the research and approaches being taken in the Northern Hemisphere toward dementia and other ageing-related conditions. Here is a quick summary of our expert talks in case you weren’t able to make it on the day! In his “ Engagingaging” presentation, Prof Paul Chamberlain talked about how we could go about designing products, services and environments to improve the quality of life and well-being for individuals. We learnt how important it is to adapt the home environment to accommodate people as they go through age-related changes and challenges both physically and mentally. Our very own Guy Collier and Nick Hayes’ presentation on designing for mild cognitive impairment (MCI) explored the strategies, supports, and resources older people use to ‘live well’ within the context of possible cognitive decline. Nick and Guy are currently working on creating an interactive online resource through co-design to help people with MCI as well as their whānau. In her talk ‘The Whare Aroha Care transition study: A collaboration between industry and academia’ Kay Shannon described how industry meets research. This was a great real world example of how research impacted the conceptualisation of Whare Aroha Care - a dementia-friendly care facility in Rotorua modelled on the acclaimed Dutch De Hogeweyk Dementia Village and designed to look like a small New Zealand town that would provide a sense of independence in a home-like environment for its residents. In “Re-designing dementia” Claire presented a vast body of research into new approaches to involve people living with dementia in the design of supported self-management, and how this helps enable fuller engagement with them and their communities and help all to contribute to more meaningful wellbeing. Richard Worrall and Justin Kennedy-Good “Community and commerce: Promoting universal design in hospital shared spaces. Both Justin and Richard have been working on the public spaces and healing environments programme at Auckland City Hospital. Their presentation focused on the ongoing implications of design decisions when creating spaces, and how to make these better for people with cognitive impairment, to ultimately benefit all users of a space. The Auckland City Hospital is undergoing refurbishing of the retail area on level 5 of the hospital. This was a real-life example demonstrating how Auckland DHB has applied design processes and methods to make the space more accessible for its users. 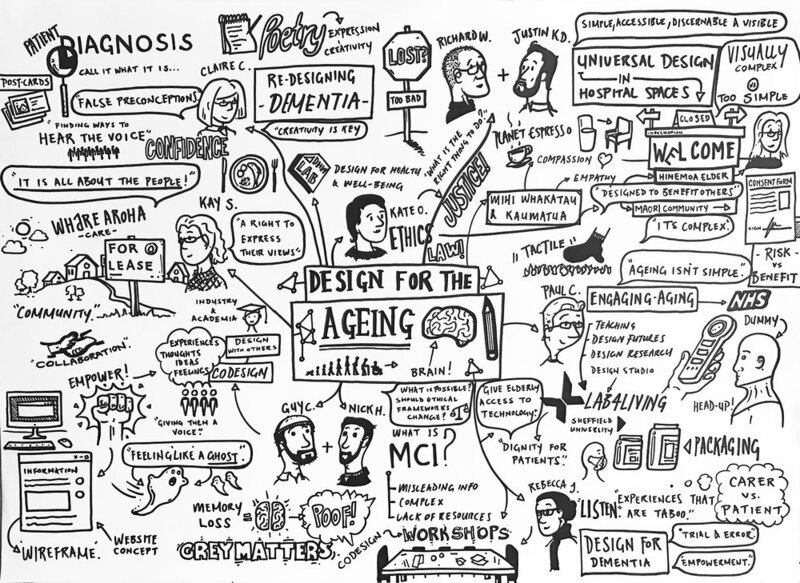 Rebecca Jury explored what everyone ought to know to design for people affected by dementia. While co-design is designing ‘with’ people, not ‘for’ people, this is not always straightforward when working with complex user groups, including those with advanced cognitive impairments. Her talk highlighted many pitfalls in the co-design process. However, a key theme was how listen carefully to people; they want to be heard and valued. Kate O’Connor’s talk on " Ethics for the ageing brain" challenged conventional thinking on research and health. “Health is designed by treatment, not by research”. Kate as Executive Manager of the ethics committee at AUT is constantly faced with difficult questions when research is needing ethics approval. She left us questioning the balance between research and consent and what is the right thing to when thinking of involving vulnerable individuals in research. Design research may be viewed within different ethical frameworks and these influence what might be ethical and moral to do. This can be made more complex when ethical research and design research are continually evolving as disciplines. However, design research is fundamentally important to improve the everyday situations of people living with dementia, but this should not compromise those who may be vulnerable as research participants. Lastly, Hinemoa Elder began with a beautiful waiata, before exploring how understanding culture is crucial to the designing for the ageing brain. Design is not for a single person, but the whole whānau - how do designers consider language, cultural practices, symbols, cues and roles along with spiritual connections. "He waiata, he akoranga. There is more to a song than it’s tune and actions". Over 100 people attended the symposium. They came from many diverse disciplines/specialisations, including architects, designers, clinicians, occupational therapists, music therapists, service improvement specialists, researchers and academics. It was a great way to share stories and explore how we might work together to explore new opportunities to develop design-led solutions to support people as they age. Thank you to all the presenters on the day and also to everyone for attending! We can’t wait for our next symposium. Watch this space!